A full-length KRONOS with a lighter touch. 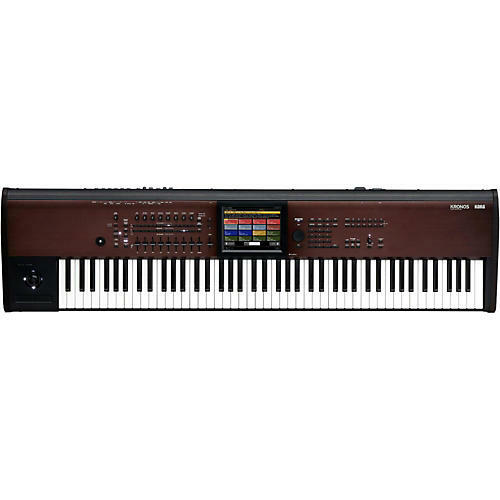 The Korg KRONOS has established itself as a premier performance and recording keyboard instrument, and serves as the chief controller and sound source hub for countless musicians and studios all over the world. With its position in the marketplace firmly established, the Korg KRONOS development team has been designing refinements that will appeal to specific musicians and producers. This latest iteration of the KRONOS differs in a few primary ways; first, the playing action is lighter than the original. This newly designed light-touch keyboard results in effortless, nimble playing from rapid organ licks to synth phrases to glissandi. Additionally, the lighter keybed makes it easier to transport, as it is 14 lbs. lighter than the KRONOS2-88. Other changes include a new look to complement its new feel. With its luxurious dark umber aluminum body and beautifully crafted sunburst wood side panels, KRONOS LS is designed to present as beautifully as it plays. KRONOS LS offers an elegant look that’s perfect for home, stage or studio. Even the mechanism of the keyboard itself has been redesigned so that the velocity is easier to control than on existing light-touch keyboards, even when playing complex chords or difficult phrases. The box-shaped keys share their look with KORG’s premium RH3 action, while providing the faster playing feel of a synth keyboard. Since the keyboard is semi-weighted, it’s also perfect for playing piano and electric piano in any style. New OS v3.1 includes Quick Layer and Quick Split functions right at users’ fingertips. Effortlessly create layers such as piano and strings, or splits such as electric piano and bass. Numerous additional OS refinements have also been made to further ensure stability and a stress-free performance environment. Apart from all of these changes, the KRONOS LS remains true to its predecessor’s nine versatile sound engines, up to 16 simultaneous effects, 16-part Combinations and so much more. KRONOS is KORG’s most powerful synthesizer ever, and to further unlock KRONOS’ potential, KORG has introduced this new light-touch 88-key model for a new level of playability and portability. The KRONOS LS is the perfect version for players who prefer a less resistant keyboard action.